The other night I woke up because of Tina. I heard her say just once Hau! (Finnish dogs say "hau".) It was very stern hau and I immediately knew that something was happening outside, nothing very big, nothing to be concerned of. 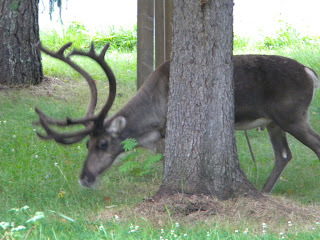 But I got up and sure enough, there was a reindeer wandering around the yard. I took one quick picture and went back to bed to catch an hour or two before getting up. Tina has been most strange this summer. She has never had a tendency to run away, but now she does that a lot. I really have to pay attention where she is now, while before when I was puttering around the yard, she was never far and came right away when called. I have been thinking that maybe this is because we used to have three dogs and now she is all alone and she really does not have companions of the same kind (Mr Cat probably does not count) and she gets bored. Mr Cat has also been peculiar, he hunts a lot and is quite successful too and while usually he keeps his treasures to himself, all this summer he had been trying to bring these critters inside. He has had luck two times but now I just stop him at the door to see what he is trying to sneak in. "The weather up here is cooler now, not bad but not hot any more, the nights already get quite dark for a little while and while all this has been going on around me, I have been digging around in my stash and searching around Ravelry. 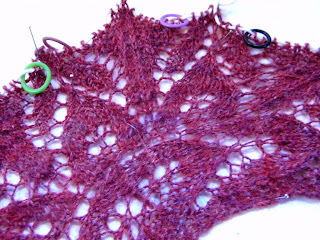 I really need to get some lace onto the needles and have been looking at Rosemary's patterns. She has plenty and I have cast on for Maia, a small shawl from her new book to be. This shawl has a little more unique construction and is a bit different in the category of lace shawls. It has a portion of stitch pattern - simple garter stitch rib - that I have never seen in lace shawls and this makes the shawl different, the eye keeps returning to the garter stitch spot, and it really gives nice contrast for the lacy patterns in the shawl. I just have to knit this to see how I like it. Also it has beads in it and I really want to try them too. The sample is knitted with high twist merino sock yarn, but I am knitting with lace weight. Because of the garter stitch rib pattern and lace weight yarn, I am using smaller needles, size 3 mm (US2,5). My choices are making the shawl smaller but the pattern tells that this can easily be made bigger by increasing one pattern repeat." I wrote the above few days ago, and since then... the lace yarn, not good, not good, ... I broke the yarn and have Citron (from Knitty winter 09 issue) going on with that yarn... Not sure I love it there either (it is handspun merino/silk) and I just might rip it again. (What is it with some yarns, they just never find their match and roll around stash until they start to pill and look wretched). And the beads for Maya did not work either, it was so pesky getting them onto the stitches that I just had to let that idea go. I will return to Maya when I find a good yarn for her. Yesterday when I was doing laundry, I ironed one cardigan that has been around for a long time and has seen better days. I really should find the final destination for her and stop wearing it. 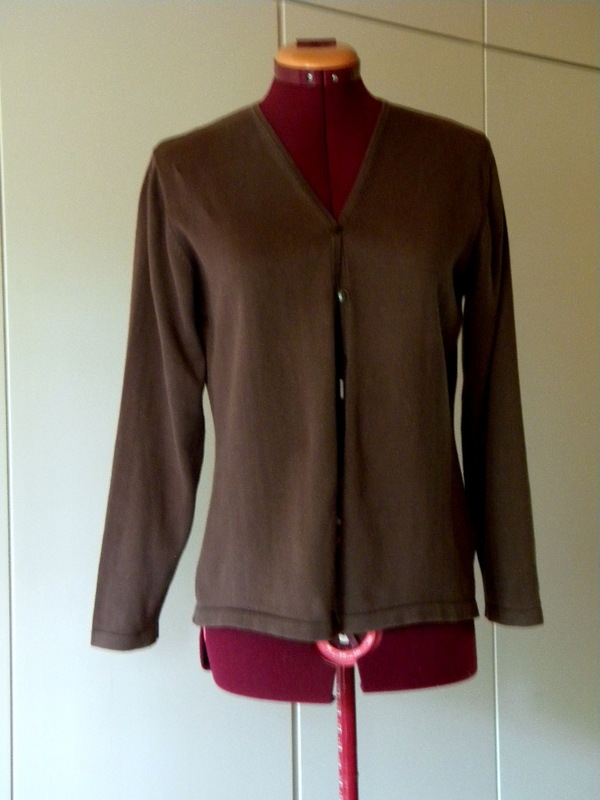 But it is so good, it is light, it is the right size for under coat, the color is just right, it does not show occasional coffee spills... Now, I am going to cut the cardigan into pieces (for pattern), find a good yarn, good, humble, wearable yarn and try to knit one like her. I will try to document every step of the way. This will be a long process but hopefully I will have made myself a good pattern with set in sleeves in the end. Good basic pattern that I can keep modifying eternally. I will search through the stash first to see if there is anything I can use. I have few heavier yarns that I would like to get rid of, so I just might need to settle with them at first. I do realize I am already tossing away the idea of having light cardigan... But nothing has been settled so far, I check my stash first. I guess this is all for now. I so love the white nights and am so sorry to see them go but then, I am happy to be knitting again. I mean knitting, not just passing the time with needles at hand. Oh, and wool with you (it will be very warm weekend here, but wool is just around the corner, this I know for sure). I never thought of cutting up an old cardigan to make the pattern. Great idea! I hope it works out well. I love the color of that cardigan. Happy New Puppy! I hope you all settle in well together. I will be interested to see your pattern making process. Although, I can't see you leaving it plain - once its done you will itch to embroider on it! Congratulations on your new dog-to-be! Please tell us, what is the breed? It looks a bit like the Welsh corgi, but not really. It is always a joy to read your posts, Lene. I miss you when you are quiet. Your reindeer looks to me like something WORTHY of getting up for! How wonderful to live so far in the north! That puppy litter is delicious. I'm sure that Tina will be overjoyed (even if she doesn't at first show it) with a new friend. I'll be very interested to see how the cardigan develops. I signed up for Rosemary's new booklet, but have yet to cast on for lack of the right yarn. I don't usually wear green, but Maia (the main reason for buying the booklet) BEGS for green! I like the look of the citron shawl but it is difficult to keep knitting when you are not happy. What a great idea, taking the cardigan apart and making a pattern. I look forward to seeing how that works. Great photo of the reindeer. I have looked at citron too - it is a lovely shawl but I haven't found the right yarn for it yet. I am knitting annis (also from knitty) for the second time it is a quick knit which I need because this will be a present for a niece that is getting married in 2 weeks. 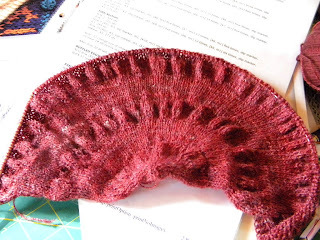 it is coming out well - the first one I knit with sock weight yarn that I dyed with jewelweed. and the one on my needles now is dyed with queen anne's lace. Isn't it sad when a faithful sweater finally bites the dust. What a great idea though, cutting it up to make a copy. Good luck! Great photos, especially Mama and her pups :^) Perhaps Tina will stay home when the pup arrives, she'll be needed for her part of the training. I agree with you regarding the cardigan, great colour (I like browns). Citron is lovely so far, but you'll know best having it in your hands, whether it stays or goes. Lene, your posts are always so nice to read because of your unique style. Thank you! I'm looking forward to your pattern project for the cardigan! 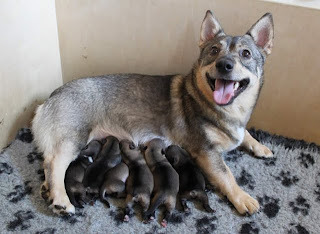 Beautiful Vallhunds - they're still somewhat rare in the states, but a friend of mine has 2 that she competes with in dog agility. Enjoy your new little bundle!